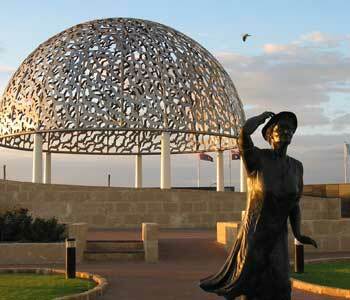 Carnarvon is located 904 km north of Perth on the west coast of the Gascoyne Region of Western Australia. Lying at the mouth of the Gascoyne River. Carnarvon's traditional owners are the Aboriginal Inggarda, Baiyunga, Thalanji, Malgana and Thudgarri people. They named this area long ago, Kuwinywardu (Kow-win-wordo), meaning 'neck of water'. The first European sighting of the Gascoyne River was in 1839, by the British explorer Lieutenant Grey. Lieutenant Grey, aboard the whaling vessel, the "Russell", landed on the mainland (present day Carnarvon) to explore the area. He named the river "Gascoyne" after a naval friend, Captain Gascoyne, and then trekked up the dry riverbed, discovering a pool of freshwater. On his return, after a near fatal journey, Grey noted that the area around the mouth of the Gascoyne River was good for agricultural development. In 1858, twenty years after Lieutenant Grey's first exploration, the area was explored once more by Francis Gregory who was looking for suitable grazing land for the government. Gregory returned to Perth with fair reports about Carnarvon. The area was settled in 1876 by the Browns and the Brockman's, who travelled from York to Carnarvon, with 4,000 sheep. Brown settled on Boolathana station and Brockman established Brickhouse station. The settlers successfully began wool production, eventually attracting farmers and Afghan camel teamsters to the area. Interestingly, many of the cameleers came from Pakistan, not Afghanistan. The camels were used to transport wool from the stations to the port ( One Mile Jetty ), ready for export. Today you can still see the reminder of this unique past in the 40m wide main street, which was built for the camels to safely manoeuvre around. During the 1920's, transportation was to go through a massive change, with the arrival of the motor vehicle. Disappearing, virtually over night, were the camels and the cameleers. By the 1930's the Gascoyne area had over 1.4 million head of sheep, with the town serving as a port and supply depot, for the surrounding pastoral industry. Carnarvon became the centre of a successful wool producing area. The aviator, Charles Kingsford Smith, saw a golden opportunity for a transport company to be set up in the area. Along with his friend, Keith Anderson, the Gascoyne Transport Company was born. Around the same time a meatworks was built to supply the local area with fresh meat, but it never eventuated as there was too much of a fluctuating supply of stock. However the building did not totally go to waste, it became a shark-processing factory for a short time and then a poor house for families during the depression. The building was nicknamed Silver City because the families who camped there were given government payments in silver coins. You couldn't possibly visit carnarvon without at least tasting the Carnarvon bananas and mangoes. The success of the banana industry in Carnarvon can be directly attributed to Mr Jack Buzolic, who in the 1920's, wrote an article about the potential for banana growing in the area. Putting his theory to the test, Jack planted the first banana sucker in 1928 and by 1930 he had his first saleable crop. The rest I guess is history. 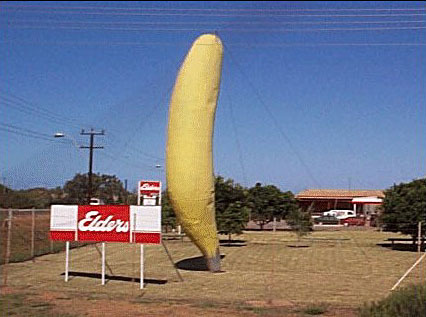 So proud of the town's successful banana industry, the local tourist bureau even bought a 10m yellow banana , which now stands on the corner of Robinson Street and Boundary Road. Today, there are over 70 banana plantations in Carnarvon, covering 350 hectares and producing 4,194 tonnes of bananas annually. In recent years, mangoes have become an equally popular fruit grown in the region. Each mango season produces on average 1300 tonnes. Following the outbreak of World War II, Carnarvon was to become involved in the worst maritime disaster in Australia's history. 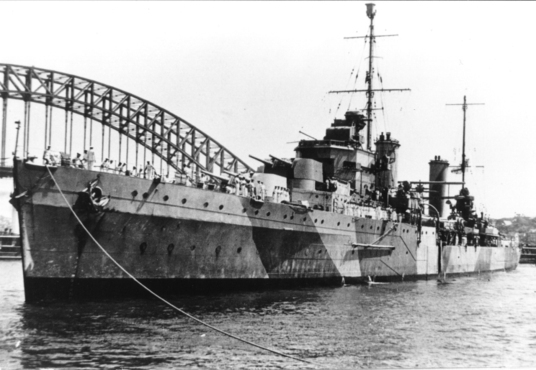 On the 19th of November, 1941 the HMAS Sydney II came under attack by a German Raider the HSK Kormoran. Somewhere off the coast between Geraldton and Carnarvon the Australian Cruiser with her crew of 645 sank and all souls on board perished. Following the pursuing battle the Kormoran also sank. Along the coast between 17 Mile Well and Red Bluff, 310 Germans managed to make it ashore. On capture they were held at the Carnarvon Goal before being sent to P.O.W. camps where they saw out the remaider of the war. The German Commander of the Kormoran, who was one of the survivors, remained adamant that the ship, fully ablaze, simply drifted off. In 2001, on the 60th anniversary of the sinking of the 'Sydney', the HMAS Sydney Memorial Drive (located along a section of Carnarvon Road) was built, in honour of the men lost in this tragic event. 645 palm trees were planted and 645 plaques were placed at the base of each tree. In 2005, the Federal Government gave funding for the continued effort in finding the ship. To this day her resting place remains a secret. Carnarvon, like many coastal towns at the turn of the 20th century, began commercial whale hunting. As early as 1912, whaling ships were operating in the waters off Carnarvon. In the 1950's the Federal Government helped fund a whaling station at Babbage Island. This station became one of the most modern whaling shore stations in the world. It was believed that over 600 whales were killed per season. Fortunately by the 1960's whaling ceased and the station was sold to the Nor-West Whaling Company (later to be renamed the Nor-West Seafoods). The 'Nor-West Seafoods' converted the whaling station into a factory for processing prawns, Shark Bay banana prawns to be exact. The company is still successfully processing prawns and even (ironically) running seasonal whale and dolphin watching tours. During the 1960's Texada Mines (now Dampier Salt) was established at Lake Macleod, which is situated 65km north of Carnarvon. The mine would become one of the world's highest bulk solar salt producers. What does that all mean? Well, evidently the saturated brine in the lake is approximately 10 times saltier than seawater. This means that concentration ponds, which are normally required to evaporate water to reach "salting point', aren't needed. In 1978 the Texada Mines sold the venture to Dampier Salt limited, who have continued to process and export salt around the world. Dampier Salt now also export gypsum, which is a hydrated sulphate of calcium which is used in the making of plaster and in treating soil.